ANNOUNCER:This is a voice speaking from America. Daily at this time we shall speak to you about America and the war. The news may be good or bad. We shall tell you the truth. ALAN HEIL: But you had at the very beginning among the pioneers, those who believed that the best policy was to tell the truth. I can remember the story of General Stillwell for example who said "The Japanese gave us a hell of a beating in Burma." Now that became a matter of some contention, as you might imagine between the policymakers in Washington and those broadcasting the news from the Voice of America then in New York, but the VOA staff held its own. And later we learned, following World War II from some of the Japanese who were interrogated about their listening experiences, that that made them really believe the Voice of America. True, it was founded as a propaganda organization to counter Axis propaganda, particularly in Germany but also in Japan. But even in the early going there were editors who stood behind the contract with the listeners to give them an honest accounting of the day's events. BROOKE GLADSTONE:You quote President Lyndon Johnson saying "I know I can't affect the broadcast companies. I know they won't listen to me. I know they won't help me, but goddamnit, I have my own radio, and I've got to make that work!" And he was referring to the VOA and its coverage of Vietnam. Wouldn't you admit that sometimes the VOA has a problem reconciling its dual roles as both a government agency and an impartial news source? ALAN HEIL: Well John Chancellor said that the Voice is at the crossroads of journalism and diplomacy. I think, however, it's increasingly clear and particularly in the 21st Century and in the post-9/11 period that there is no substitute for a full and fair disclosure of events. I think that there is a hunger for the straight story. BROOKE GLADSTONE: How many languages is the VOA broadcast in? ALAN HEIL: It's broadcast now in 54 languages. BROOKE GLADSTONE: And do you count Special English among them? ALAN HEIL:Not really. Special English being a variant of Standard English was designed back in 1959 to aid comprehension of those listeners for whom English was a second language. BROOKE GLADSTONE: It was an English that was composed of a 1500 word vocabulary. ALAN HEIL: Quite correct and slowly delivered, and also--the idea was, in the main, one thought per one sentence. BROOKE GLADSTONE: And what could you convey to the world in Special English? ALAN HEIL: Oh, you would be remarkably surprised. If I may, I'd like to read from page 279 of the book. ALAN HEIL: The absolutely marvelous poem sent to us by A.V.B. Mannon of Tamil Nadu in India, and he called it An Ode to Special English. HAIL THEE, SPECIAL ENGLISH! THOU ART A VIRGIN MAIDEN-- UNCORRUPTED, SIMPLE, EASY. YE RANG A FAMILIAR TONE TO ONE AND ALL, LEARNED AND WISE AS MUCH TO THE UNINITIATED. SIMPLE IS BEAUTIFUL. NO FRILLS, NO TWISTS NOR PRETENSIONS. YE WIND YOUR WAY TO THE HEART TO STRIKE A FAMILIAR CHORD. IT'S NEITHER THE KING'S NOR THE QUEEN'S, BUT THAT OF VERY COMMON FOLK. IT IS A SYMPHONY IN PROSE. LONG LIVE SPECIAL ENGLISH. BROOKE GLADSTONE:[LAUGHS] You know it, it reminds me of one of VOA's greatest contributions to world culture isn't in language at all but in music! I think that the most famous and, and certainly most beloved voice of the Voice of America is probably that of Willis Conover! WILLIS CONOVER: Time for jazz -- Willis Conover in Washington with the Voice of America Jazz Hour. -- and the hall burst into applause -- this is at the height of the Cold War -- and there was a standing ovation that lasted for several minutes. BROOKE GLADSTONE: Let's talk about the VOA in China during Tiananmen Square. ALAN HEIL:-- and then anyone listening to it can see the critical impact of jamming, on blocking information from the Chinese people. [WOMAN SPEAKING IN CHINESE] [STATIC-Y SOUND INTERFERENCE OVER] I think even the Chinese themselves conceded before that martial law was imposed on that day in May of 1989 that the Voice probably had 60 million listeners. It was I think clear that its impact was historic in 1989. BROOKE GLADSTONE:One last question Mr. Heil. We have the BBC, we have CNN everywhere - we've got the internet reaching into corners where even CNN can't reach -- why do we need the VOA? ALAN HEIL: I would have to go and quote David Burke who was the first chairman of the U.S. Broadcasting Board of Governors who said that CNN can be seen in hotel lobbies and industrialized society. It cannot be seen in refugee camps. The U.S. simply has to have a voice, I believe, and that's a voice that reflects us. It's not a voice that's an official radio as much as it is one that reflects America -- an American optic as a West African editor once put it. BROOKE GLADSTONE: Alan Heil, thank you very much. BOB GARFIELD:That's it for this week's show. 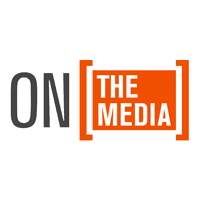 On the Media was produced by Katya Rogers, Janeen Price, Megan Ryan and Tony Field; engineered by Dylan Keefe and Rob Christiansen, and edited-- by Brooke. We had help from Dave Goldberg. Our webmaster is Amy Pearl. BROOKE GLADSTONE:Arun Rath is our senior producer and Dean Cappello our executive producer. Bassist/composer Ben Allison wrote our theme. You can listen to the program and get free transcripts at onthemedia.org and e-mail us at onthemedia@wnyc.org. This is On the Media from NPR. I'm Brooke Gladstone.